Kitesurfing in Mui Ne is almost guaranteed for the whole year round with average of 230 windy days in a year and steady winds at 12++ knots. What once used to be a tiny fishing village with an isolated stretch of beach where only pioneer travellers set their camps in the sand is now a much bigger fish. Mũi Né is a coastal fishing town that belongs to Phan Thiết, the capital city of the Bình Thuận province, about 4 hours drive North-East of Ho Chi Minh City (Saigon). The feel of fishing village is still here, but the coastal strip is now decorated with resorts and the tourists had slowly outnumbered the locals. Mui Ne has gone a long way since the 90’s and became one of the most popular kitesurfing destinations in Southeast Asia. Its name ‘Mũi Né’ comes from many origins, but the very first meaning comes from the local fishermen inhabiting the area and fishing in these waters many many years ago. They usually faced strong sea storms, so they would find a shelter in a cape. In Vietnamese, the cape was called ‘Mũi’, and ‘hide’ meant ‘Né’. The second story talks about the youngest daughter of Cham King. She was the owner of this land. She was also known as ‘Né’, therefore, when they built her temple in the cape, they decided to call this area ‘Mũi Né’. Getting to Mui Ne is as easy as pie. The Ho Chi Minh City international airport is relatively close by and lots of cost effective transfer options are available to get you to the destination. 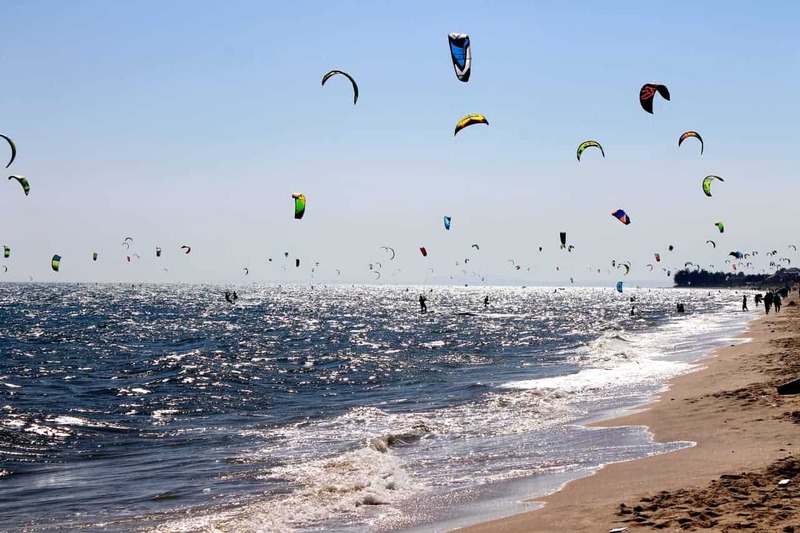 There are two main kitesurfing seasons in Mui Ne, the South West Summer Season and the North East Monsoon Season. Both come with pretty good wind conditions. During the summer season starting from May till October, the wind mainly blows from the South. It blows every day, but is not as strong as the winter wind. The wind in summer blows somewhere between 10 to 14 knots. It usually starts with a lighter breeze during the morning hours that gradually picks as the day goes by and becomes much stronger later in the day. You’ll have good and steady wind later in the afternoon, but only lasting for about 3-4 hours hours. Summer season is ideal for the beginners taking kitesurfing lessons or if you’re just enjoying a regular holiday as well as the occasional kitesurfing session. You can just spend a day with your folks doing all the usual tourist stuff and then sneak out for an awesome session later on in the day. If you’re planning a kitesurfing holiday in Mui Ne in the summer season, look into a bigger kite size. Anything around 14m goes. During the winter season starting from the end of October and running all the way up till late March, the wind turns around blowing from the North direction and becomes much stronger and more consistent. It usually picks up already in the early morning and blows all the way through the day till the sunset. The windiest days are from January to March when it blows at 20-25 knots and occasionally up to crazy 40 knots. You’ll be able to have a session most days riding anything from 7m to 12m kite. Nothing is guaranteed in April. April is just the end of the monsoon season and tends to be very humid with no wind or swell, so if you’re planning your kitesurfing holidays around this time, work around it otherwise you may be disappointed. On average, you get 230 windy days in a year in Mũi Né with the winds of 12+ knots. On average - that’s pretty awesome, isn’t it? December and January is the peak time obviously due to the Christmas holidays and New Year and also the busiest time of the year as you’d expect. February and March are considered to be the best choice as the weather and wind conditions are pretty steady and can easily fit any experience level from total beginners to pros. Mũi Né main beach - Most folks like to kitesurf at the main spot of Mui Ne, where waves build up as the wind picks up during the day. Mornings are usually the best time for the kitesurfing lessons and the beginners to practise as the wind tends to be much lighter. The main beach has also the safest conditions for the kitesurfing lessons. If you feel confident enough, you can take about a 1 km downwinder to the Harbour Wall. If you become mates with the locals, you’ll probably hear about this epic Phan Thiet Downwinder. It’s about a 15 km ride from the main Mui Ne beach to beach just outside the Phan Thiet town. You have to be a bit of a soldier for this kind of thing as you’ll be going through several tricky spots including a fleet of fishing boats, not to mention that the wind you started on may pick up significantly by the time you reach the destination. You’ll land on the beach with some great waves, if the swell’s good. Some do it under an hour, but take your time, it’s the best experience. Harbour Wall - This is a small beach located West of the Mui Ne beach, mainly known by the locals, but somehow the word gets around. It is the only kitespot in Mui Ne area with a solid flat water. Get there in the morning before the wind picks up for an awesome freestyle! The winds start changing direction early in the afternoon and gets pretty gusty, so that’s the time to head off. The beach is quite a walk back to the main road to get a cab, so if you do that, make sure you have a pick up organised unless you’re up for finishing your session with a sweaty lip. The Cemetery - This kitespot is not exactly beginner friendly. You you should only go out if you have enough confident level of experience. The wind is cross onshore, mostly onshore. The point is very rocky with a swell, so don’t get too close. There is just enough beach to launch and land. It’s a great kiting here, but there is not much space for errors. Malibu (Hon Rom) - Malibu is in the same bay as The Cemetery. It is very similar setup with mostly onshore wind, except you can go much further down the bay to get away from the vicious rocks. This beach could have a large swell, so if you’re into riding the waves, you may be up for a treat here. Suoi Nuoc - This beach is in the next bay to Malibu. Suoi Nuoc has a pretty similar setup and conditions to Malibu, except the wind here is full on-shore which makes it really challenging. But a good spot to kitesurf, good swell when it comes. The Turtle Island - This place is much further down the Suoi Nuoc bay. A great kitespot where the wind funnels through the mainland and the little island that’s about 200m off the shore (The Turtle Island). There is a sandbar in between which makes it an enjoyable spot with flat surface water and great little waves on the outside. The wind is side on-shore here, but tends to be quite gusty. Phan Rang - The hidden secret is located near Phan Rang city, about 3-4 hour drive North off Mui Ne town. Perfectly suited for all experience levels, this kitespot just seems to have the whole lot. It’s a large protected reef with just the perfect flat water lagoon on the inside and some epic waves on the outside. You’ll get a steady and consistent side-shore wind here often reaching 25+ knots, occasionally going over 30+ knots. If you have a small kite, take it. You’d regret it otherwise. Mui Ne is notoriously famous for its red and white sand dunes. Keep it for a non-windy day. The red dunes are just outside the town, pretty easy to get to. Once there, you should also checkout the ‘Fairy Stream’, the mini version of the Grand Canyon looking like formation. It can get quite busy, but it’s worth few pictures. The white dunes are a little further, about an hour drive out of town. But if you want to know what it’s like to walk in the desert, you should definitely check it out. If it wasn’t for the ATV’s buzzing around, it feels like you really are in a desert. Vietnam is well known for its food and flavours. Take a cooking class! There’s plenty on offer and if you like cooking, why not add a few Vietnamese specials into your recipe book.